According to Peter this was the diagnosis of a classical Roman engineer when checking a transistorized PA that went dead after an accidental reversal of the polarity of its supply. Above we see that same engineer, obviously setting up a 2 meter Moxon. I got a six digit San Jian frequency counter for use with my BITX20. I was trying to figure out how to put it in a box and mount it on the rig when I realized that the counter fits almost perfectly in an Altoids tin. THE RADIO GODS HAVE SPOKEN. Mikele's rig is a real "International Brotherhood of Electronic Wizards" kind of project. The Belthorn design is out of England. N6QW has added a lot of California influence. The Nokia screen adds a bit of Finland. And of course Mikele's excellent construction makes this a profoundly Croatian rig. We love seeing rigs in their "out in the open " phase. Thanks Mikele! Ken Marshall G4IIB here the guy that wrote the SDR Primer in Sprat 162. I have been listening to your excellent podcasts. You guys cover a lot of ground in the May issue and touched on to the SDR dongle, its potential for future developments etc. I noted that you where going to buy another to cover VHF. Well if it ain't too late consider this New version by Newsky they are already getting difficult to get a hold of and are only available in the USA. It uses an R820T2 tuner (better LNA) an upgraded and stable crystal oscillator, a reinforced antenna coax and socket. The one I managed to get hold of also had a modified PCB with solder pads for the the Q channel (pins 4&5) to connect the toroid. Incredable at 22 of your Bucks. See the pictures and read all about it on amazon.com. All we need is for them to slot a 12 or 16 bit ADC in and we could have a truly great SDR receiver. 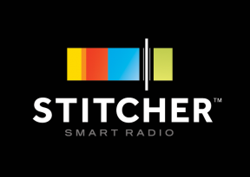 I noticed in your podcast you mentioned radio astronomy and satellite reception. Ironicaly back in 2013 this is how I started with SDR dongles. I read an aticle on the web on meteor scatter and started experementing with a dongle. Meteor scatter hunting is a bit like watching paint dry unless there is a known storm. So this led me on to the Funcube satellites. The signals from which although QRP 200mW are very stong and you can receive them on almost any antenna. The funcube dashboard software is available for free from AMSAT and alows you to download telemetry. 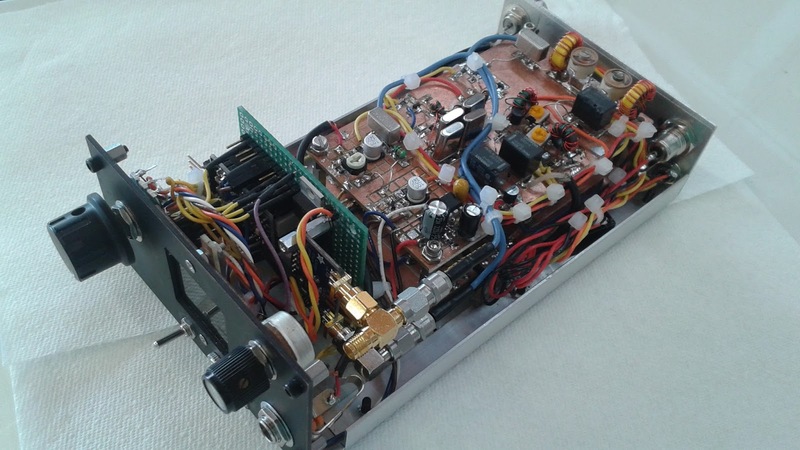 You can also listen to amateur SSB an CW transmissions. There are lots of satellite tracking software available too. This then led onto weather satelite picture reception I built a 4 ele turnstile antenna for this but I found that I needed an LNA for reception at my location. I then started to listen to the amateur bands. Like you Bill I became interested in radio at the age of 11 and got licensed in the early 70's but work commitments meant I had a 30 year absence from Ham Radio until I stumbled on these SDR Dongles. They got me back into the hobby and I joined the GQRP Club. I noticed that almost no one in the QRP fraternity was talking about RTL SDR hence I started writing the Primer and submitted it to George in late 2014 for publication in Sprat. 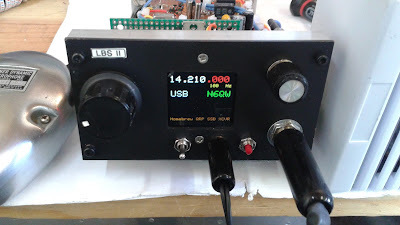 As you know it appeared in the Spring Sprat and seems to have generated lots and lots of interest in the QRP community. I am delighted by this response and look forward to lots more interesting articles and podcasts. Have fun with your dongle. PS I wrote another article on getting these dongles to work under Linux. Linux uses completely different architecture so that the software used is completely different to windows. I notice that the software I use for Linux is also available on Mac OS which uses similar architecture (UNIX) so in theory it should also work on a Mac. Quite a few people have expressed an interest in getting a dongle to work on a Mac. As I do not poses a Mac I have not tried this out. Just found a short Youtube QRP video which is quite fun. It's of the radio side of Thor Heyerdahl's cross-Pacific Kon-Tiki raft expedition in 1947, operating /MM with 7 watts. I found a longer description of what they had and what they did - including a thrilling tale of drying components on coral reefs while they desperately tried to make contact having washed up on an island - but not of the unusual parrot incident with a hydrogen balloon-lofted antenna during the voyage. That's only in the video. 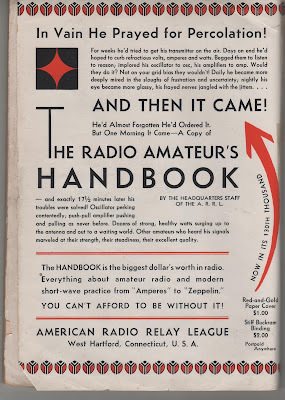 It's all gripping adventure radio stuff, and shows what HF and a bunch of tubes could do before the digital satcom age. 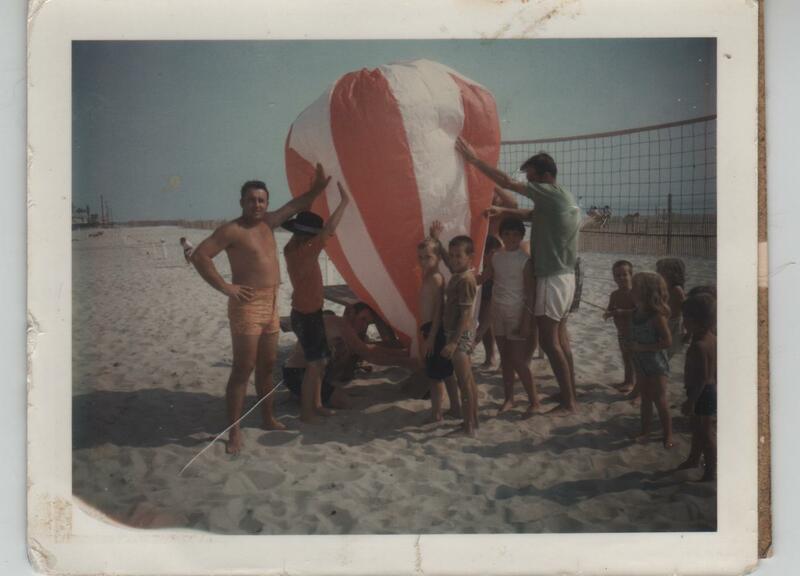 "The expedition used call sign LI2B and carried three watertight radio transmitters. The first operated on the 40 and 20 meters, the second on 10 meters and the third on 6 meters. Each unit was made up entirely of 2E30 vacuum tubes providing 10 W of RF input. As an emergency backup, they also carried a German Mark V transceiver originally re-created by Britain's Special Operations Executive in 1942. 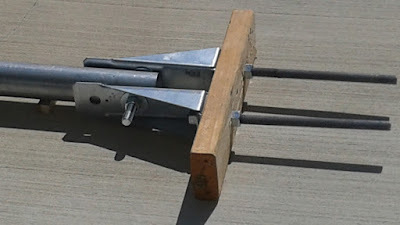 Other equipment included a hand-cranked emergency set of the Gibson Girl type for use on the maritime bands, a special VHF set for contacting aircraft and two British Mark II transmitters. The Kon-Tiki also carried a National Radio Company NC-173 receiver. Dry batteries and a hand-cranked generator supplied the power." I wrote earlier about these students and their cool Apollo telemetry device. Here is an update. As per your discussion with Pete in #177 I can indeed confirm that the correct pronunciation of Belthorn is “Bell-Thorn,” like Bell and Thorn concatenated. I named the design the “Belthorn SSB IF Module” in honour of the village I was living in at the time I developed it. I wanted to put the village on the map and in doing so leave my mark. The design was published as a two part article in RadCom May/June 2000 intended to offer an alternative to the Plessey SL600/1600 IF strips of the late 70s early 80s. These integrated designs opened up simple SSB construction to many but by the mid 80’s sources of SL600/1600 ICs had all but dried up. 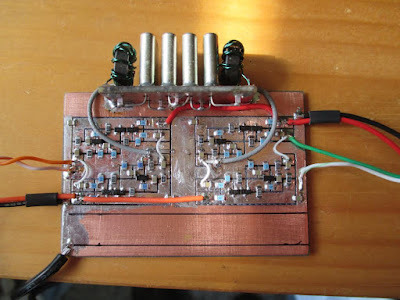 I thought that a new design using readily available parts would be worth developing to offer a simple and repeatable basis for building an SSB transceiver. The origin of the name “Belthorn” is quite interesting – although of little relevance to radio! Before the industrial revolution the village used to be on a pack horse route. to this day there is a house at the top of the village called “Bell in the Thorn” many years ago this used to be an inn. It’s thought that it takes its name from when a Bell hung in a thorn bush or tree nearby was used to signal when a horse change over was required to carry loads up and down the hill, probably from the mines or quarries on the nearby moors. The link for the “Eden9” which you may find interesting is; https://groups.yahoo.com/neo/groups/eden9/info There is a power point presentation in the files section which describes the project and which features a section on receiver design. It may be a useful primer for those interested in the design process. 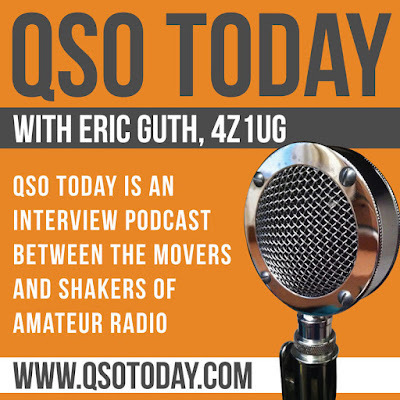 Please help Eric out by subscribing to his podcast and by linking to his site. I'm sure he'd appreciate comments on our interview. Thanks Eric! And as Shep would say: EXCELSIOR! Bill's verdict: BITX40 with Yaesu filter, Si5351, and TIA best of the 3 rigs. You will remember Colin as the builder of that beautiful BITX20 that he first used from his backyard and later used with great success from a hilltop in Northern England. In this video we see Colin demonstrating his Michigan Mighty Mite. Lots of soul in that little machine! Colin notes that this rig worked well from the start. The Radio Gods were obviously pleased by his use of a tuna tin as the chassis. I think they also liked the MePads from W1REX and the Tek 465 'scope. And of course the T-shirt was obviously a key element in Colin's success. I've been on kind of a building hiatus due to various issues, but after seeing the work being done with the termination insensitive amplifiers I had to start noodling again.....as Pete would say. Well I have decided to build a TIA (ZIA according to Pete) SSB transceiver. I've decided to homebrew everything including the DBM, crystal filter, and even the Si5351 module. As I wait for more parts to come in, I wanted to show the 2 TIA amps and crystal filter assembly I've built. I've included a screenshot of the pass band response through the amps and the crystal filter. It looks the same in both directions and everything fits into an area of 2 x 2.5 inches. With the space left on the board, I hope to be able to put my SBL-1 clones on as well. I follow up as I get more completed. Been There, Done That: "...he begged his oscillator to osc and his amplifiers to amp." 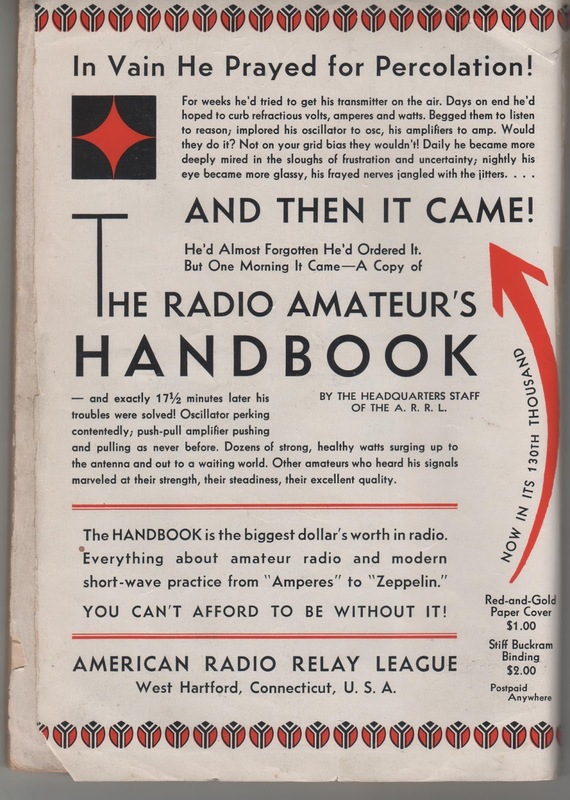 This ad is from the December 1931 issue of QST. This copy has a LOT of mileage on it. 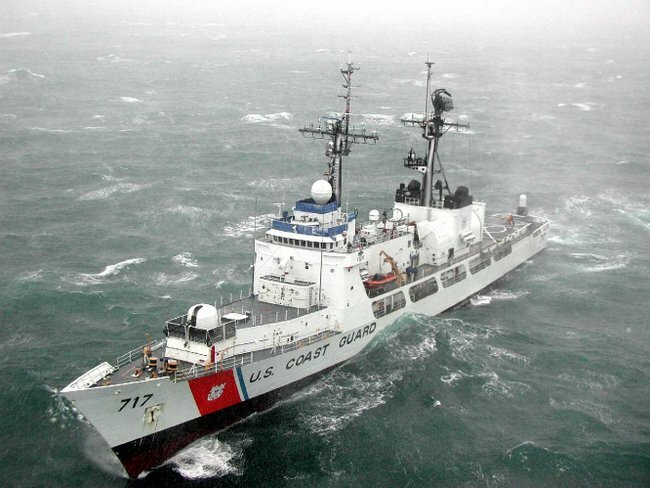 In 1993 or 1994, David Cowhig (now WA1LBP) was living in Okinawa Japan and was operating as 7J6CBQ. I was living in the Dominican Republic and operating as N2CQR/HI8. We were both contributing to a 73 magazine column (as "Hambassadors"!) and we were both in the Foreign Service. I wrote to David -- he wrote back, sending me some old QSTs, including the one from which the above ad is taken. This ad shows that many of the homebrew/troubleshooting woes that we face today are very old. And that having access to good technical books is very important when you are trying to overcome these difficulties. I found Peter's recording of the DSB signal being received by a DC receiver to be very interesting. We've long been warned about the very ironic incompatibility of DSB rigs and DC receivers. In "W1FB's Design Notebook," Doug DeMaw wrote (p 171): It is important to be aware that two DSSC (DSB) transmitters and two DC receivers in a single communication channel are unsatisfactory. Either one is suitable, however, when used with a station that is equipped for SSB transmissions or reception. The lack of compatibility between two DSSC (DSB) transmitters and two DC receivers results from the transmitter producing both USB and LSB energy while the DC receiver responds to or copies both sidebands at the same time." Bummer. In essence, we've been warned that the simple DSB/DC rigs we've put on the air cannot communicate satisfactorily with similar rigs. We are, it seems, doomed to only speak with SSB/Superhet rigs. Simplify things by assuming we are transmitting only a single audio tone of 1000 Hz through our DSB transmitter. The rig's VFO is at 7100 kHz. The 1 kHz tone results in signals at 7101 and 7099 kHz. Along comes somebody with a Direct Conversion receiver. If he were able to put (and keep) his receiver oscillator on EXACTLY 7100 kHz, he would end up (by taking the difference products from the product detector) with a 1 kHz tone resulting from the 7099 kHz signal AND a 1 kHz tone from the 7100 kHz signal. But there would be phase differences between these two signals, so you would end up with a less than pure 1kHz tone. (Did I get that right?) And if -- as is likely -- your local oscillator is a bit off frequency you'd get a real mess. If for example the local oscillator was at 7100.1 kHz, you'd have tones at 900 Hz (7100.1 - 7101) and 1.1 kHz (7100.1 - 7099). Yuck. 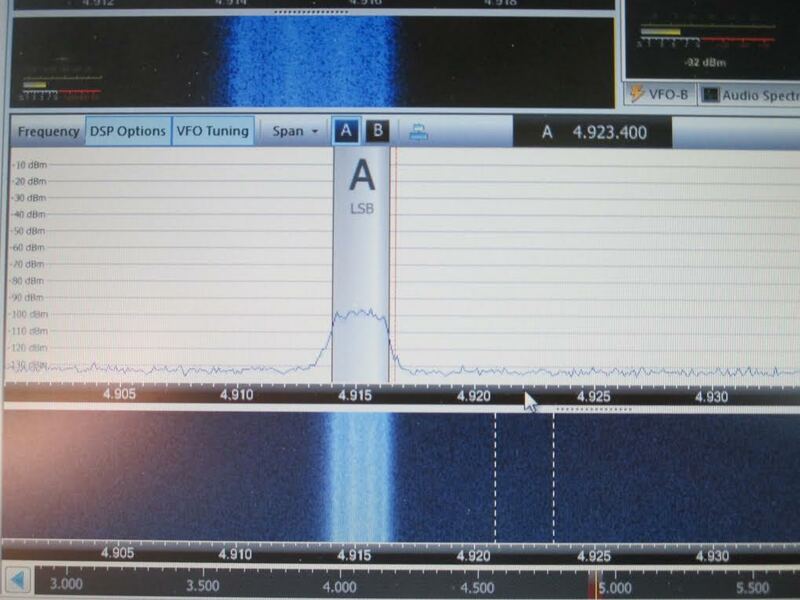 I think you can actually hear many of the DC-DSB problems as Peter tries to tune in the DSB signal of VK7HKN using the DC receiver in the MDT transceiver. It is indeed unsatisfactory. But don't worry. It is highly unlikely that when using a DSB rig you will encounter another DSB rig. I speak from experience on this. Pity. Tonight is the "Night of Nights"
Interview in China with Arduino's Massimo Banzi: "Be nice!" I have been a listener of the Soldersmoke Podcasts for several years now and I have worked my way through most of the back episodes of the podcast. It is terrific production and has taught me so much about radio electronics. I have also read all of your books. Thanks for what you do for this hobby. Attached is a photo of my recently completed Michigan Mighty Mite. The FFT function in my scope confirms a good clean signal and it sounds great when I listen to it on another radio. I am sure that the photo depicts one of the worst looking MMMs to date. I built it on a solderless breadboard as I have never built anything using Manhattan or ugly construction techniques. 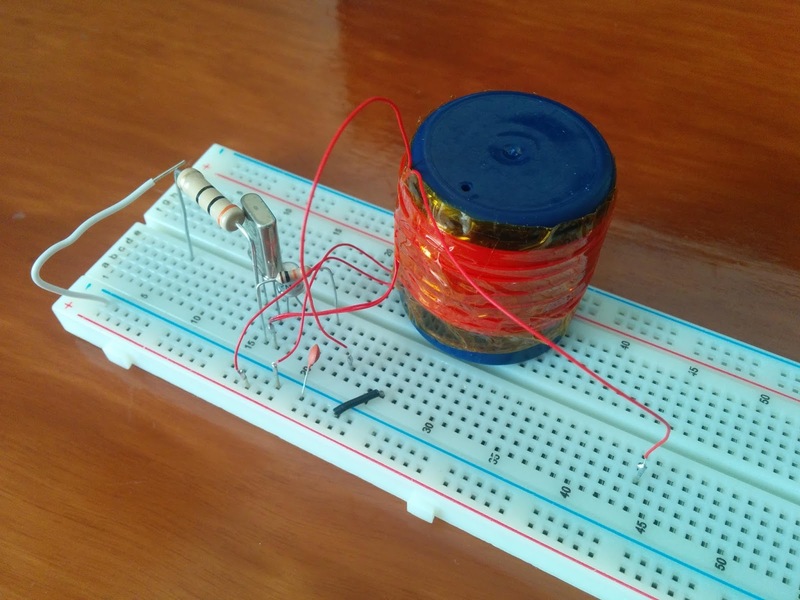 It was a great introduction to very basic homebrew electronics. 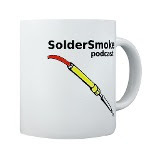 I've just listened to Solder Smoke episodes 168-170 and I'm following your advice. My Michigan Mighty Mite sits on my desk only lacking the variable capacitor. I was amazed that I had everything needed in my junk box! Including a 3.575611 crystal. Last night I dreamt that the incomplete breadboarded Mighty Mite was beckoning me. I walked over to the desk and I had the palpable sense that the Mighty Mite itself wanted to oscillate, as if by arranging the components in this way I created something alive. I touched the tank and it began oscillating by itself without the variable cap. The universe seemed complete in that sweet moment. Bryan: You might be able to make your dream come true with a fixed value cap. Do you have something of about 150 picofards? Try that. It might work. Or do you have an old transistor radio that could sacrifice its tuning cap? I have had similar homebrew dreams. Well, nightmares mostly. I dreamed that in a fit of frustration I took ALL the parts off the BITX 17 board. That was a scary one. I'll cc Steve Silverman to see if he could help with the variable cap. 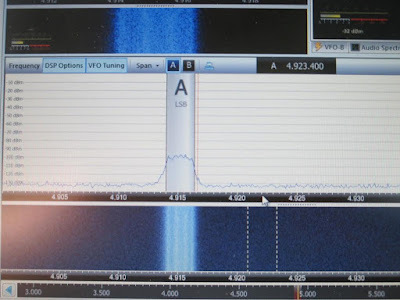 While in India I was licensed at VU2LHO and worked a lot of US hams with a 135' flat-top and open-wire feed. 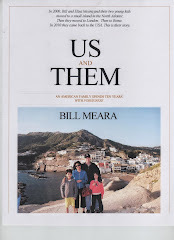 I had the antenna strung between two bamboo towers atop the embassy housing 2ND-story roof-top. I also put up a 3/8 wave vertical on the roof for 10 meters. That little antenna had 110 radials stapled into the roof scree and worked very well! The rig was a HW-101. I was in Kathmandu, Nepal from early 1980 to late 1982. I could not obtain a license there, but became good friends with Father Moran, 9N1MM, and would often spend time up at his place putting his Drake station on CW. Pretty cool being real DX! Warrenton, Virginia is not far from my QTH (it is the birthplace of Cappuccio the wonder-dog). Pete writes: This video shows the LBS XCVR shrunk down to a mainboard that is 2.5 Inches by 4.5 inches. The board contains the 20 Meter Band Pass Filter, the RxTx Mixer, a TUF-3, two bilateral amplifier stages a 5.185 MHz Homebrew Filter. a TUF-3 PD/BM. The Audio amp stage and the microphone amp. 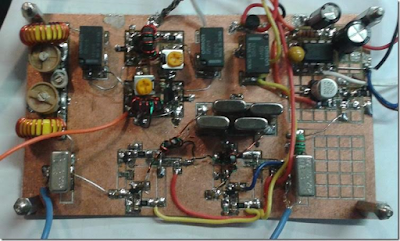 Not built as yet is the bi-directional stage that on receive is the RF amp and on transmit the Tx pre-driver stage. Extensive use of SMD components makes the size reduction possible. The transmit final stages will be on a 2nd board that is stacked on top of the mainboard. An Arduino Pro-Mini does all of the control for the Si5351 VFO/BFO. The final size will be 4X6X2. Oh it also has a color display! http://www.n6qw.com/. -- George Dobbs, G3RJV. George puts the "L" back in solder and is asked to comment on his recent (richly deserved) awards. -- G4GXL talks of his new duties as President of QRP ARCI. -- K8IKE Talked about looking at the amateur radio station as a system. 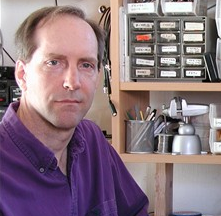 -- KC3BRA talks about coming to ham radio from the Hacker/Maker world. 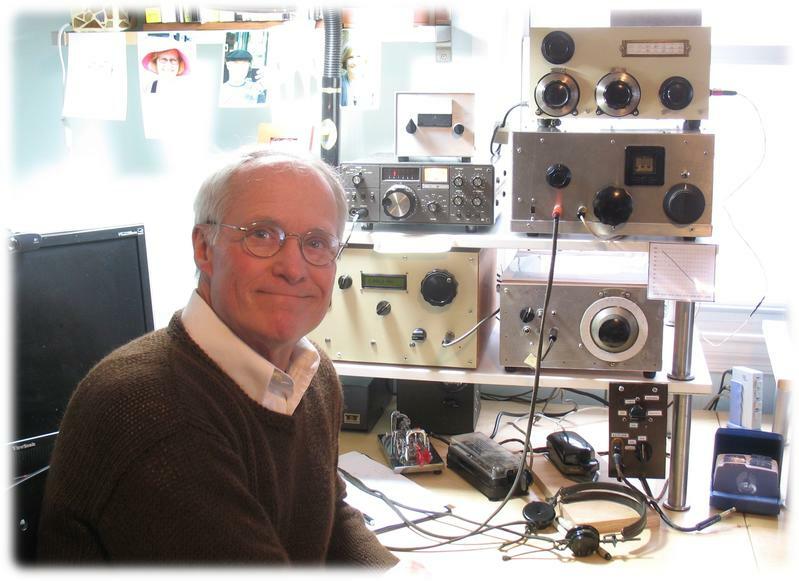 -- KW5GP talks about his new book on Arduinos in ham radio. 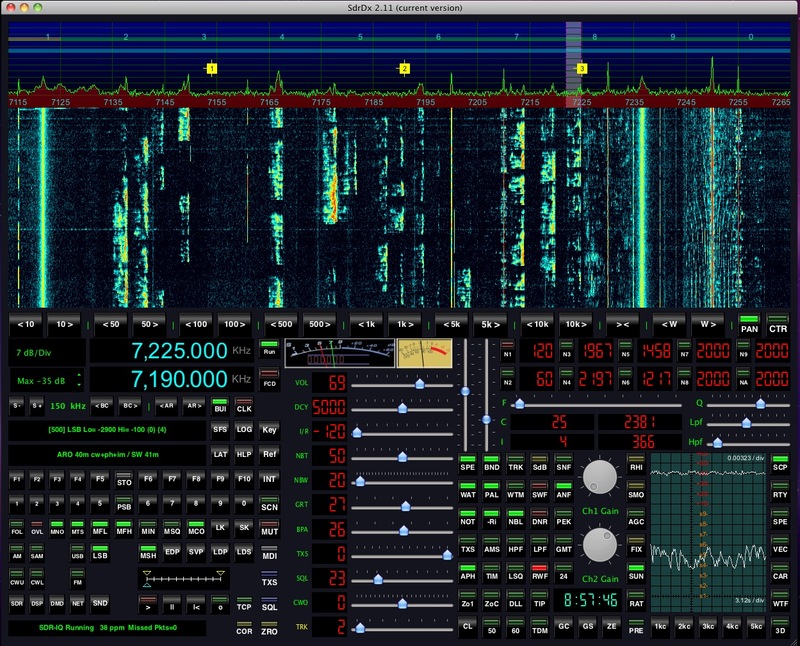 -- W1RFI talks about the work of the ARRL lab. 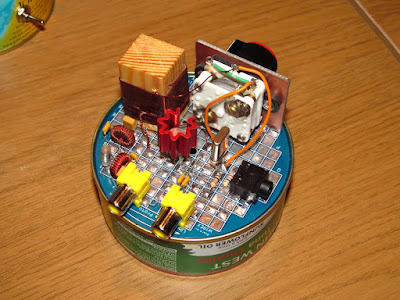 -- M0XPD talks about new trends in ham radio involving microcontrollers. 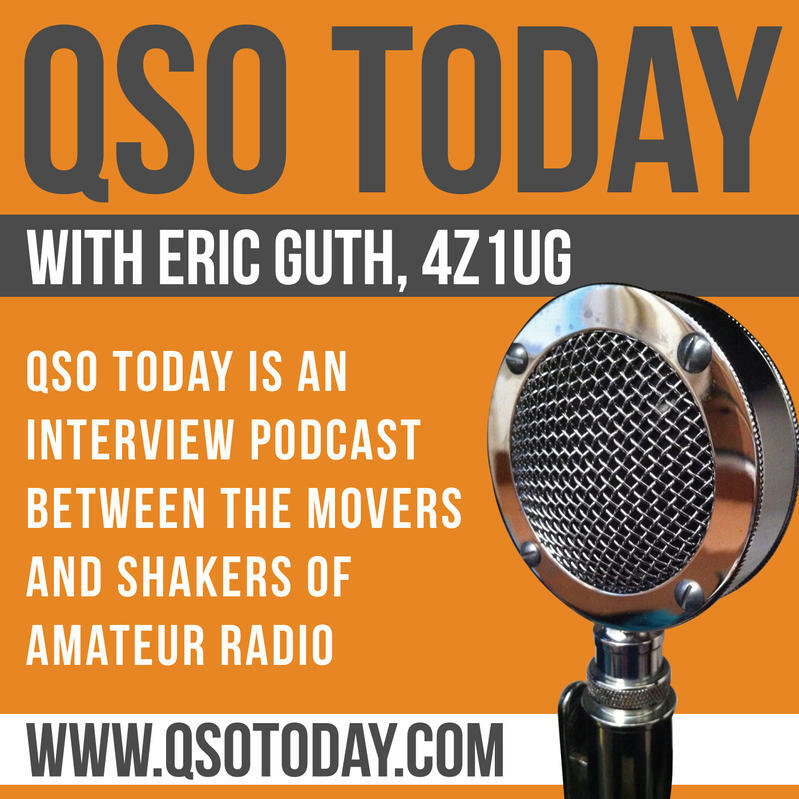 Paul also talks about Pete Juliano N6QW. Pete had asked Paul to accept on his behalf the QRP Hall of Fame induction plaque. Well done Paul. 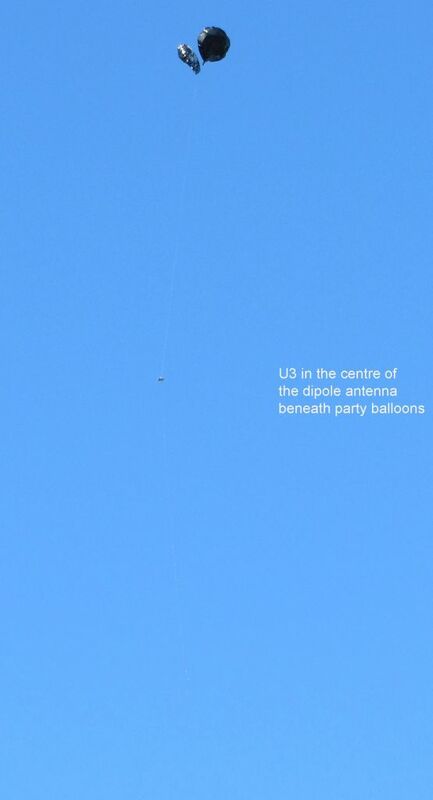 Two Party Balloons, an Arduino and an Si5351 FLY! ALOFT! UP IN THE AIR! Farhan alerted me to this. This is clearly the coolest use so far of the Dynamic Duo (Arduino+Si5351). You take two party balloons. You build a little payload consisting of an Arduino Nano, an Si5351 board, a GPS module and a battery. You load the Nano with firmware that will take the GPS info and transmit it via WSPR and JT9. Then you release the whole thing and sit back to receive the telemetry packets that tell you where the thing is. Very cool. Very cool indeed. Farhan has built a very cool antenna tuner. More important, it is the subject of the first of what we hope will be many postings on his new VU2ESE blog. I really like the re-purposed Sony meter, and the homebrew feedline for the multi-band (80-6 meters) doublet. This is clearly a suitable antenna and tuner for the multiband Minima. I have been inspired! I hope to brew up some feedline soon! No more store-bought transmission line for me!